"Ferrigno" redirects here. For the Italian wine grape also known as Ferrigno, see Cesanese Comune. Louis Jude "Lou" Ferrigno (born November 9, 1951) is an American actor, fitness trainer, fitness consultant and retired professional bodybuilder. As a bodybuilder, Ferrigno won an IFBB Mr. America title and two consecutive IFBB Mr. Universe titles, and appeared in the bodybuilding documentary Pumping Iron. As an actor, he is best known for his title role in the CBS television series The Incredible Hulk and vocally reprising the role in subsequent animated and computer-generated incarnations. He has also appeared in European-produced fantasy-adventures such as Sinbad of the Seven Seas and Hercules, and as himself in the sitcom The King of Queens and the 2009 comedy I Love You, Man. Lou Ferrigno was born in Brooklyn, New York, to Victoria and Matt Ferrigno, a police lieutenant. He is of Italian descent. Soon after he was born, Ferrigno says he believes he suffered a series of ear infections and lost 75 to 80% of his hearing, though his condition was not diagnosed until he was three years old. Hearing loss caused Ferrigno to be bullied by peers during his childhood: “They used to call me ‘deaf Louie, deaf mute’, because of my hearing and because of the way I sounded”. Ferrigno started weight training at age 13, citing body builder and Hercules star Steve Reeves as one of his role models. He was also a fan of the Hercules films that starred Reeves. Ferrigno's other personal heroes as a child were Spider-Man and the Hulk. Ferrigno attended St. Athanasius Grammar School and Brooklyn Technical High School, where he learned metal working. After graduating from high school in 1969, Ferrigno won his first major titles, IFBB Mr. America and IFBB Mr. Universe, four years later. Early in his career he lived in Columbus and trained with Arnold Schwarzenegger. In 1974, he came in second on his first attempt at the Mr. Olympia competition. He then came third the following year, and his attempt to beat Arnold Schwarzenegger was the subject of the 1975 documentary Pumping Iron. The documentary made Ferrigno famous. These victories, however, did not provide enough for him to earn a living. His first paying job was as a $10-an-hour sheet metal worker in a Brooklyn factory, where he worked for three years. He did not enjoy the dangerous work, and left after a friend and co-worker accidentally cut off his own hand one day. Following this, Ferrigno left the competition circuit for many years, a period that included a brief stint as a defensive lineman for the Toronto Argonauts in the Canadian Football League. He had never played football, and was cut after two games. During competition, Ferrigno at 6 ft 5 in (1.96 m) weighed 285 lb (130 kg) in 1975, and 315 lb (142 kg) in 1992. Ferrigno competed in the first annual World's Strongest Man competition in 1977, where he finished fourth in a field of eight competitors. In the early 1990s, Ferrigno returned to bodybuilding, competing for the 1992 and 1993 Mr. Olympia titles. Finishing 12th and 10th, respectively, he then turned to the 1994 Masters Olympia, where his attempt to beat Robbie Robinson and Boyer Coe was the subject of the 1996 documentary Stand Tall. After this, he retired from competition. 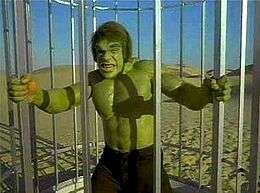 From the 1978 The Incredible Hulk episode "Married"
In 1977, Ferrigno was cast as the Hulk in The Incredible Hulk. Ferrigno and Bill Bixby – who played the Hulk's "normal" alter ego – became friends; Ferrigno has described Bixby as a "mentor" and "father figure" who took him under his wing. Ferrigno also singles out the instances in which Bixby directed Ferrigno in some episodes as particularly memorable. Ferrigno continued playing the Hulk role until 1981—although the last two episodes were not broadcast until May 1982. Later, he and Bixby co-starred in three The Incredible Hulk TV movies. In November 1978 and again in May 1979 Ferrigno appeared in Battle of the Network Stars. In 1983, Ferrigno appeared as John Six on the short-lived medical drama Trauma Center. 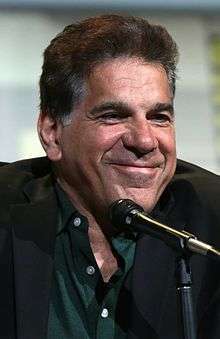 Ferrigno played himself during intermittent guest appearances on the CBS sitcom, The King of Queens, beginning in 2000 and continuing until the program's conclusion in 2007. He and his wife Carla were depicted as the main characters' next-door neighbors. Because of his role as the title character on The Incredible Hulk, he is often the target of Hulk jokes by Doug and his friends. He made cameo appearances as a security guard in both the 2003 film Hulk and the 2008 film The Incredible Hulk, in which he also voiced the Hulk. Ferrigno appeared as himself in the 2009 feature film comedy I Love You, Man. Ferrigno trained Michael Jackson on and off since the early 1990s, and in 2009, he helped Jackson get into shape for a planned series of concerts in London. Ferrigno took part in a Smosh video, titled "I love Lou Ferrigno", in which he is tracked down by one of Smosh's members, Anthony, in Hollywood. The skit ends with Ferrigno knocking Anthony unconscious, in response to Ian's claim that Anthony stole Ferrigno's Butterfinger. Ferrigno has his own line of fitness equipment called Ferrigno Fitness. In January 2009, he provided equipment to The Price Is Right for use as a One Bid prize, and demonstrated the equipment himself. In 2010, Ferrigno appeared in "My Two Chads", an episode of Sonny with a Chance, appearing as himself in an episode of the fictional series MacKenzie Falls. He also voices the character Billy the Hero in the animated series Adventure Time. Ferrigno's voice was utilized (in composite) for the Hulk in the 2012 film The Avengers and its 2015 sequel Avengers: Age of Ultron. In 2014, Ferrigno appeared as Zaminhon, the Orion slave trader, in the Star Trek Continues episode Lolani. In 2016, Ferrigno appeared as a playable Lego version of himself in Lego Marvel's Avengers. In February 2006, Ferrigno was sworn in as a Los Angeles County, California, reserve sheriff's deputy. In November 2010, Ferrigno was sworn in as a member of a Maricopa County, Arizona, volunteer sheriff posse, which also includes actors Steven Seagal and Peter Lupus, in order to help control illegal immigration in the Phoenix Valley area. Ferrigno was a contestant on season five of the NBC reality television series The Celebrity Apprentice, which premiered in February 2012. He appeared on the program in order to raise money for his charity, the Muscular Dystrophy Association. Ferrigno was Team Unanimous' project manager for the task depicted in the fifth episode, "I'm Going to Mop the Floor With You", which was to create a viral video to promote O-Cedar's ProMist Spray Mop, placing him in competition with actress Tia Carrere, the project manager of the women's team, Forte. In addition to the usual $20,000USD awarded to the charity of the project manager of the winning team, O-Cedar pledged an additional $30,000 for that task. Team Unanimous' video—in which Ferrigno appeared dancing while mopping—won the task, winning the $50,000 for Muscular Dystrophy Association. He was fired in episode nine, "Ad Hawk", which involved creating a 60-second commercial for Entertainment.com. In June 2012, Ferrigno was sworn in as a reserve deputy to the San Luis Obispo County, California, Sheriff's Department. There he completed the law enforcement academy. In September 2013, Ferrigno was sworn in as a special deputy to the Delaware County, Ohio, Sheriff's Department. Due to ear infections suffered soon after birth, Ferrigno lost 75 to 80% of his hearing and has been using hearing aids since the age of five. Ferrigno says his hearing loss helped shape his sense of determination in his youth, saying, "I think that if I wasn't hard of hearing I wouldn't be where I am now. Early on, as a youngster it was difficult, but I’m not ashamed to talk about it because many people have misconceptions about hearing loss; like who has hearing loss and what it’s like not to hear, so I do talk about it. I think my hearing loss helped create a determination within me to be all that I can be, and gave me a certain strength of character too. Anytime I do a movie or a TV show, I make them aware of my hearing loss at the beginning, and that makes it much easier for all of us to communicate and get the job done." Ferrigno married Susan Groff in 1978, divorcing a year later. On May 3, 1980, he married psychotherapist Carla Green, who then also began serving as his manager; she later became a personal trainer. They have three children, Shanna, born 1981; Louis, Jr., born 1984; and Brent, born 1990. Shanna has a recurring role as Nurse Janice in Days of Our Lives, and appeared in the NBC series Windfall, as well as the television movie Within, and in 2005 she appeared in the E! reality television series, Filthy Rich: Cattle Drive. Louis, Jr. was a linebacker for the University of Southern California Trojans football team. 2004 My Wife and Kids Gay convict Episode "Illegal Smile"
2010/12/14/16 Adventure Time Billy Episodes: "His Hero", "The Lich", "Billy's Bucket List", "Crossover"
↑ Jim Schmaltz (February 2004). 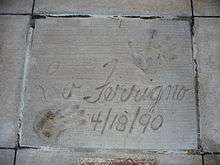 Matt Ferrigno: 1925-2003. Flex. Accessed 2008-08-01. 1 2 Mabe, Catherine "Lou Ferrigno: Living, Acting and Bodybuilding with Hearing Loss". Disaboom. Retrieved February 8, 2012. ↑ Doughterty, Margot (May 16, 1988). "Green with Indignation, Lou Ferrigno Is Back in Bulk as the Incredible Hulk". People. Vol. 29, No. 19. ↑ "How Lou Ferrigno Went From Bullied, Skinny Kid To 'Incredible Hulk' (VIDEO)". huffingtonpost.com. Jan 30, 2014. Retrieved 15 May 2016. 1 2 "ALL ABOUT LOU FERRIGNO". BodybuildingPro.comApril 9, 2013. ↑ "How Pumping Iron Gave Birth to the Incredible Hulk". Arnold Body Building. Retrieved 5 April 2013. ↑ Grech, Ron. "Lou Ferrigno to Hulk up at the Mac". Daily Press. May 2011. Accessed 2011-09-19. ↑ Bonnie Siegler. Fame & Fortune: Lou Ferrigno. Accessed 2008-08-01. ↑ The Complete Directory to Prime Time Network and Cable TV Shows, 1946-Present. Ballantine Books. 2003. p. 1227. ISBN 0-345-45542-8. ↑ Jeff Otto (May 27, 2008). Special Report: "Hulk" Edit Bay Visit. Dark Horizons. Accessed 2008-05-27. ↑ Smith, Michael David. "Lou Ferrigno: Michael Jackson Was Energetic and Happy in Training". AOL News. Retrieved 2009-06-19. ↑ "Lou Ferrigno Biography and Bodybuilding Stats". About-Muscle.com. 1 2 3 Messer, Ron (2010-10-10). "NY Comic Con: Lou Ferrigno Interview – Opens Up About The Avengers, Mark Ruffalo as The Hulk, and Chuck". Collider.com. Retrieved 2010-10-10. 1 2 Collura, Scott (May 8, 2012). "So Ferrigno *Is* in The Avengers". IGN. 1 2 "Exclusive: Lou Ferrigno Says He's Back To Voice the Hulk in Avengers: Age of Ultron". Nuke The Fridge. Retrieved April 22, 2014. ↑ Lou Ferrigno becomes reserve LA County sheriff's deputy (February 13, 2006) AP. Accessed 2008-08-01. ↑ "Lou 'The Hulk' Ferrigno Joins Posse Fighting Illegal Immigration". (November 18, 2010). Fox News/Associated Press. Accessed 2011-01-02. ↑ "I'm Going to Mop the Floor With You". The Celebrity Apprentice. Season 12. Episode 5. March 18, 2012. NBC. ↑ "Ad Hawk". The Celebrity Apprentice. Season 12. Episode 9. April 8, 2012. NBC. ↑ Linn, Sarah. "Lou Ferrigno sworn in as reserve deputy for Sheriff's Office". ↑ Salsman, Tara. "Lou Ferrigno is sworn in as Delaware County's newest Special Deputy". Retrieved November 15, 2013. ↑ Player Bio: Lou Ferrigno Jr. USCTrojans.cstv.com. Accessed 2007-01-01. 1 2 3 4 5 6 7 8 9 History of Mr. Olympia: Lou Ferrigno. Schwarzenegger.it Accessed 2007-01-01. 1 2 "History of the Men's World Amateur Championships". IFBB.com. Accessed 2007-01-01. ↑ "Tessa Thompson Joins The Marvel Universe In 'Thor: Ragnarok'". Deadline.com. Retrieved April 11, 2016. ↑ Crandall, Steve (January 26, 2014). "Star Trek Continues Episode 2 Prepares For Launch". Star Trek Continues. Retrieved February 15, 2014.